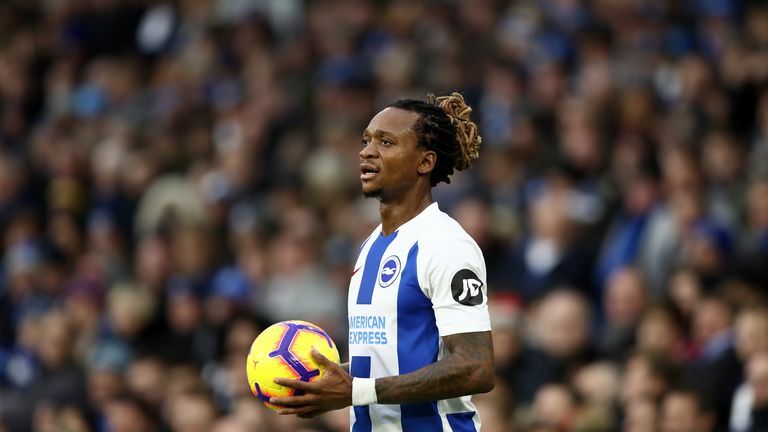 Brighton manager Chris Hughton described the abuse directed at Gaetan Bong as 'not nice' and said that the club must do all they can to support their player. Brighton boss Chris Hughton has called for the Football Association to clamp down on derogatory chanting after Gaetan Bong was targeted by West Brom fans on Wednesday. The defender was subjected to boos and chants when he came on as a substitute in the Seagulls' 3-1 extra-time FA Cup fourth-round replay win. Brighton fans also aimed chants at Rodriguez, calling him a racist, and West Brom boss Darren Moore insisted he did not hear the songs towards Bong. He said: "I didn't hear the chant. I heard the chorus of boos. We know what the incident was. "The game is finished and over with, we move on. We can't let these things overshadow the game." Brighton progressed after Glenn Murray scored twice in extra time to set up a fifth-round visit of Derby next week. Florin Andone had levelled after Kyle Bartley’s odd opener, where the defender hooked in from point-blank range while almost standing off the pitch. But Andone was lucky to still be on the pitch after catching Sam Field with a first-half elbow. "Normally if there's any incident generally I know about it. I haven't seen it and no-one has mentioned it to me," added Hughton. The Baggies hit the crossbar through Hal Robson-Kanu after Leon Balogun also hit the woodwork for the visitors. The hosts played the final 20 minutes of extra time with 10 men after Robson-Kanu limped off with the Baggies having made all their changes. Moore added: "There were some youngsters who performed admirably for the club. It looked like we’d be able to see the game out but I knew the pressure would come. "When it did come, there was a little bit of indecision by us and they showed why they are where they are in the Premier League."